Alright, now I have a proper vessel to take the day’s journey looping around by water from Blue Mountain Lake to Long Lake. Here I am with my ultra-light canoe. 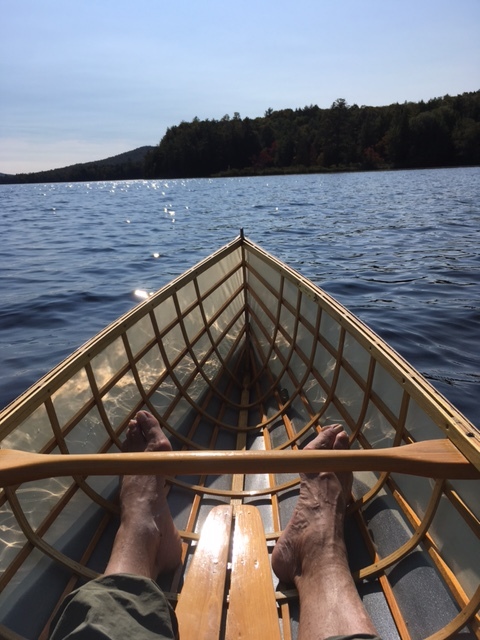 My ultra-light canoe on Long Lake. My guideboat is in the background and the Seward Range is up the lake. If you read my previous blog you might suspect that these boats are vulnerable to a tear in the Dacron fabric covering. I have never had such a problem but once I lent one to a friend and he somehow found a sharp object that tore a hole in the hull. He quickly sank. To avoid such a mishap I always carry a roll of duct tape with me when in one of these small wonders. When you are in the middle of a lake in an ultra-light you have the unsettling feeling that you are being levitated and could find yourself swimming for shore at any moment. These craft are very flexible which adds to that sensation but also gives them an extra degree of resilience. My plan to paddle from Blue to Long Lake was to leave the public beach at Blue Mountain Lake at about 8:00 am, paddle west through the Ectford Chain, take the Marion River Carry to the Marion River, then into Raquette Lake, then head northeast through Raquette Lake to the carry into Forked Lake (pronounced Fork -ed with emphasis on the ed). Then go generally east on the southern arm of Forked until it ends at the campground beach, Now begins a half mile carry and a paddle along the North Point Road. 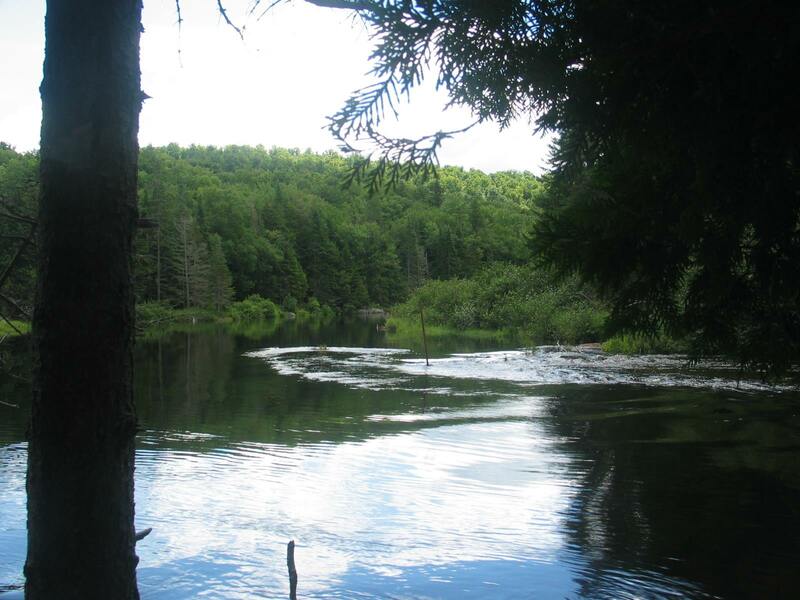 The Raquette River has a stretch of rapids just after the campground beach, necessitating the carry, but there is a quiet, beautiful paddle down to Buttermilk Falls. 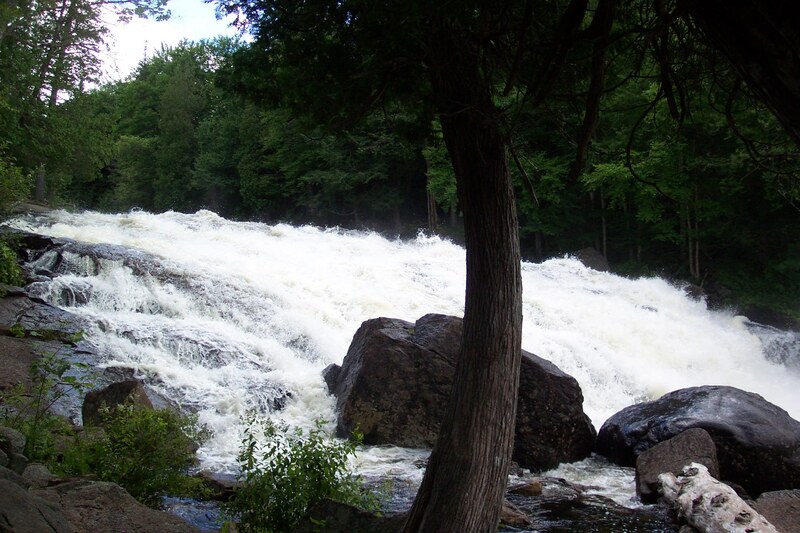 You mustcarry around Buttermilk Falls and down a stretch avoiding the Raquette River rapids. The carry takes the North Point Road to the put-in at Long Lake. Now you are essentially home with a paddle of about 3 miles ahead of you. The Ice Age has determined my route today. One of the receding glaciers dumped a moraine of gravel and sand just south of Blue Mountain Lake. This “dam” stopped any flow of water coming down from the north from reaching the Hudson River. So the Raquette River flows north until it reaches the St. Lawrence River. Here is my route on a map of the lakes. 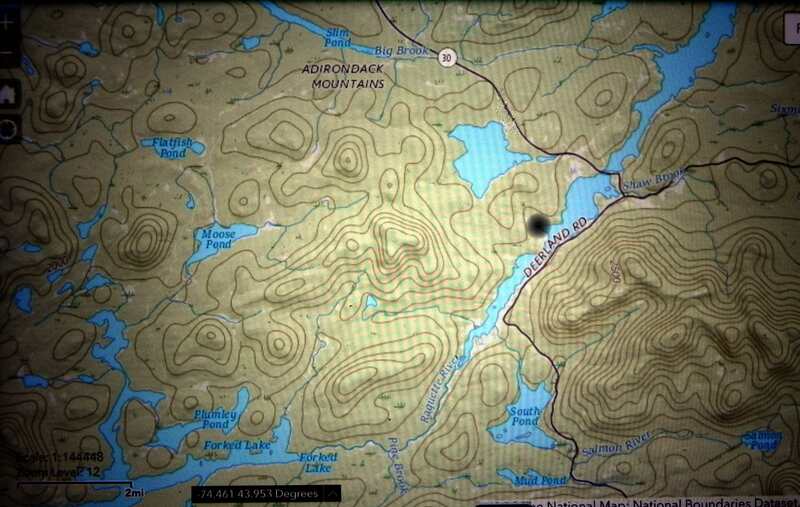 Route of my paddle from Blue Mountain Lake to Long Lake. The black dot on the right is the starting point and the one at upper middle is the pull-out at the Forked Lake campground beach. The end of the journey from Forked Lake to our Camp on Long Lake.. I had one concern when planning this trip. A strong weather front would come through and cause dangerously high waves. Both Raquette and Blue are situated such that a strong westerly wind blowing across them can raise some impressively high waves. Fortunately, that was not the case on the day I chose for my adventure. The wind was out of the northwest but not overly strong. I was counting on it to stay out of the northwest. I would have to paddle against it for the first leg of my trip but then it should be off my stern quarter for most of the trip. So I set off on a beautiful summer day to make the loop from Blue Mountain Lake to Long Lake. I tell my Fran and my Mom that I will return home at 6 pm. I have no idea where I got that prediction but it came very close to reality. I pack a lunch, water. duct tape, and a rain jacket just in case. 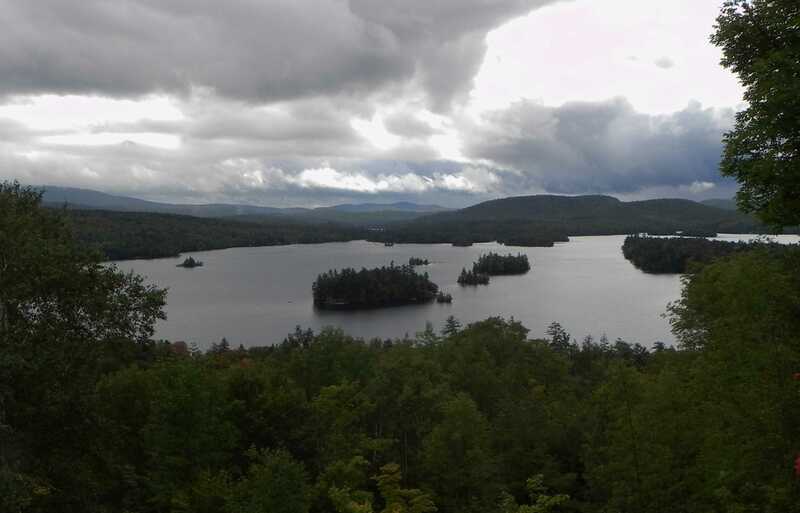 Here is a photo of Blue Mountain Lake taken from the Adirondack Museum. The opening into Eagle Lake is in the far distance and in line with the middle of the large island in the foreground. I leave the town beach at Blue Mountain Lake and paddle west to the small opening into Eagle Lake. I pass the place where the grandiose Prospect House once stood and the still very much alive Hedges, a Great Camp still in operation. I pass under a bridge into Eagle Lake, the first of the Eckford Chain. There is a large airplane hangar on the north shore. That seems a bit incongruous. But I remind myself that this area has always been moneyed. On into Utowana Lake. The western end has what I would call a dead swamp. There are dead trees and vegetation at that end. After my research on the Durants I realize that this is the result of William Durant’s scheme that raised the water level of these two lakes to accommodate steam boat traffic. This evidence of vegetation drowned over 100 years ago is still here. I pull out at the western end of Utowana which is at the eastern end of the Marion River Carry. I hadn’t expected to see any evidence of its former use. But just under water I see the remains of what was once the steam boat landing. My light weight canoe is easy to carry. I throw it over my shoulder and grab a hold of the forward thwart. I carry the paddle in my other hand and my other stuff in a day pack. Traversing the Marion River carry doesn’t take long and I am soon in the Marion River headed towards Raquette Lake. At first the River is full of twists and turns but then it straightens out. 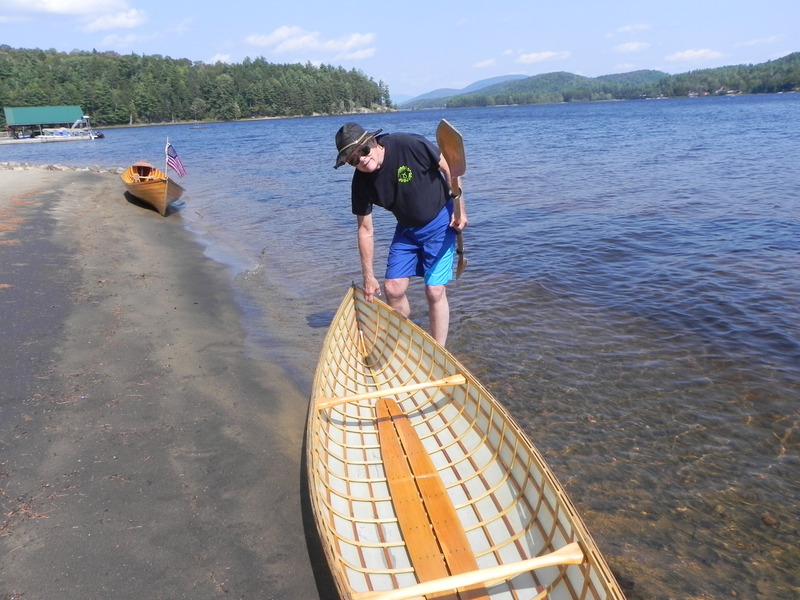 It seems to take much paddling but finally I reach St. Hubert’s Lake, part of Raquette Lake. W. H. H. Murray (Adirondack Murray) spent many days in Raquette Lake. It was a favorite of his. Any of his favorite lakes he called a “beautiful sheet of water”, quite a poetic term. Indeed Raquette Lake is a beautiful sheet of water in the truest sense. It is very irregular in shape with many bays that contribute to over ninety miles of shoreline. I go between Woods Point and Osprey Island. Adirondack Murray spent many summer days on Osprey Island. The wind has changed direction and is now out of the northeast. So my wish that it would stay out of the west and “push” me home was not to be. I didn’t take a map with me so I am going by “dead reckoning”. I will head north until I reach North Bay. 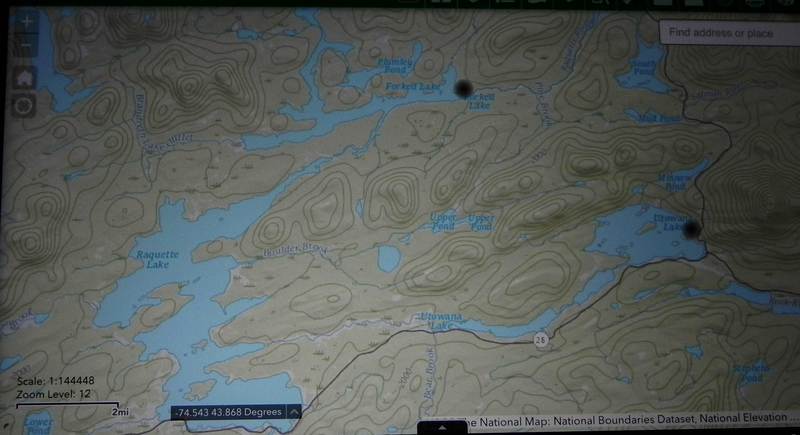 Then I’ll head northeast into North Bay and continue to bear northeast until I reach the carry to Forked Lake. Raquette Lake has few camps with road access so there is lots of boat traffic taking people to their water access only camps.. I’ll need to watch out for them. I pass Tioga Point. My son and his new bride camped there soon after they tied the knot. They each took a lightweight canoe that I had built. The canoes easily took them and all their gear. They were expecting a wilderness experience but soon after dark the motor vessel William Durantwith Dean Pohl in command came into view. They had a band on board who wanted everyone within miles to hear their music. So much for wilderness experience! Why is it that things look so different from a canoe than from you think they should from reading a map? You really have to trust your instincts about your heading sometimes. After almost 5 miles of paddling I reach the pull-out for the carry to Forked Lake. The carry is not long and I am soon headed to the pull-out at the Forked Lake campground. We spent many summer vacations at the Forked Lake campground so it is like an old pal to me. Wildlife takes no heed to humans at the campground and black bears roam freely after dark. Fran and I had just set up our tent and climbed into our sleeping bags one late twilight evening when there was a noise quite close by. We had a large triangular window in the tent that was facing out onto the lake which was lit up by the long North Country twilight. Suddenly the silhouette of a large black bear appeared in the window and slowly ambled away. Fran levitated over me to get as far away from the bear as possible and commanded that I do something. Thankfully there was nothing to be done, the bear was only interested in food .and was off to the next campsite. There are many loons on Forked. I have found loons to be curious creatures who like to check us out. One day I was out on Forked rowing my guideboat toward the campground. Because I was rowing I was only vaguely aware of what was in front me. Suddenly a loon, only a few yards away, passed by. Apparently I was more surprised than he since he could easily have avoided me. He was just checking me out. I pull out at the campground and begin a carry around rapids that continue for about a half mile. I then put in to the Raquette River It is a beautiful stretch of smooth water but that will soon change. 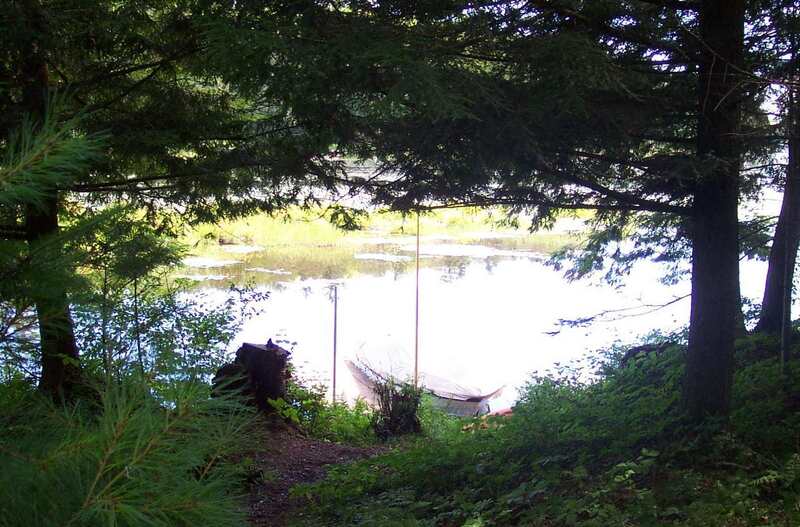 The Raquette River began as it flowed out of Raquette Lake near where the canoed carry is. The next stop is Buttermilk Falls. Indeed you had better stop here or its all over but the shout’n. As you can see Buttermilk Falls is quite impressive. The pull-out is quite near where the falls begins. Don’t go exploring here, the consequence could be fatal. Just pull-out. Here is what the River at the top of the Falls looks like. The Raquette River just above Buttermilk Falls. The carry around the rapids below Buttermilk Falls is about a half mile long. You walk along North Point Road and it mostly downhill so it is not so bad as carries go. I reach the carry into Long Lake and put-in. Almost home now, only about 3 miles to go. Here is our dock. It is is off a bay from the main lake and is about two miles from Town. Our dock at Long Lake. I pull in at about 6 pm, just as promised. I calculate that I have paddled for 12 miles and carried for about 1 1/2 miles.